As a job seeker, you must know your target job’s requirements, top skills, and duties. Reviewing these, especially the receptionist job description, helps you know how it’s like working as one. Reviewing Job Description Examples: What’s in It For You? One, it’s good to check job description examples for you to get the gist of the job tasks. They may vary from one firm to another, but they have a lot of similarities when it comes to its nature. Two, you may include this as powerful resume keywords. Through this, you’re optimizing your resume for the Applicant Tracking Software (ATS) most companies use to screen resumes. This helps you get your resume noticed, which heightens your chance of being called for an interview. Three, it equips you with the stiff competition when it comes to the rising number of applicants for this job. 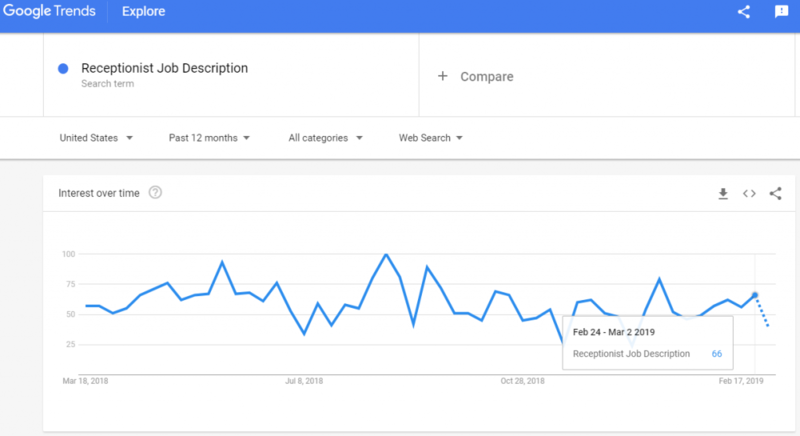 Google Trends states a search increase for the term “receptionist job description” toward the 1st week of March 2019. Searches are high in Maryland, New York, and Georgia. What do these pieces of data imply? Simply put, more and more are interested to apply for a job as a receptionist. Now, it’s up to you how to step up your job hunt game and be ahead among the rest. Also, receptionist jobs are expected to grow 9% by 2026 (BLS). So, expect a tight competition for this job. Get ready with your job application and stand out by crafting a powerful resume. A receptionist is usually the company’s first point of contact. They handle queries, direct employees and customers, and perform other clerical tasks. They must welcome, greet, and help guests. Also, they must coordinate front-desk tasks, including phone calls. At times, they may as well be asked to arrange for transportation services. In detail, receptionists greet clients and visitors and help them with their concerns and queries. These are done in person, through calls, or emails. Further, receptionists deal with special client concerns in a professional way. How can you tell you’re fit to be a receptionist? Before applying, you must check the job qualifications and requirements first. You must be at least a high school graduate. Any related experience is a plus. Further, great receptionists have excellent communication skills (verbal and written). While greeting visitors, you must have a positive attitude and a strong work ethic. Hirers spend an average of 6 seconds to screen one resume. With this, how can you make sure your resume passes the 6-second test? Likewise, companies use ATS to screen resumes, so, you must fill yours with the right keywords. Another way is to check these top skills and put them on your resume. Landing your dream job has many factors. Of course, a well-written receptionist resume is one. A better way of improving yours is to seek help from the best resume writers. Need help to write your receptionist resume? Contact us now for inquiries or see and avail Resume Valley‘s professional resume writing services now!